The old Hay Bay Church at Adolphustown in eastern Ontario, is two hundred years old and remains the oldest Methodist building in Canada. As we begin her third century, we are producing a kind of "congregational" journal. Of course there has been no regular congregation to meet there Sunday by Sunday since 1860 when they moved to a new church building a few miles away. Yet this Grand Dame comes alive each summer for the thousands of visitors who seek inspiration there. They, and you, make up her family. The Trustees are her guardians. In The Hay Bay Guardian we hope to bring you news and information about the Hay Bay Church. There will be news of coming events and reports on what has happened, restoration plans, historical research, poetry, reminiscences of visitors, stories of people (past and present), book reviews, and almost anything connected with this historic church and early Methodism. At present, until we can measure the interest in such a journal, it will appear once a year. 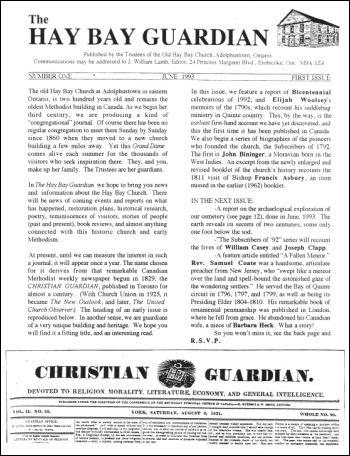 The name chosen for it derives from that remarkable Canadian Methodist weekly newspaper begun in 1829, the CHRISTIAN GUARDIAN, published in Toronto for almost a century. (With Church Union in 1925, it became The New Outlook, and later, The United Church Observer.) The heading of an early issue is reproduced below. In another sense, we are guardians of a very unique building and heritage. We hope you will find it a fitting title, and an interesting read. 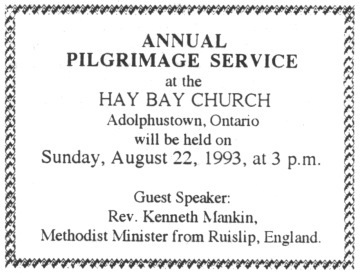 In this issue, we feature a report of Bicentennial celebrations of 1992, and Elijah Woolsey's memoirs of the 1790s, which recount his saddlebag ministry in Quinte country. This, by the way, is the earliest first-hand account we have yet discovered, and this the first time it has been published in Canada. We also begin a series of biographies of the pioneers who founded the church, the Subscribers of 1792. The first is John Bininger, a Moravian born in the West Indies. An excerpt from the newly enlarged and revised booklet of the church's history recounts the 1811 visit of Bishop Francis Asbury, an item missed in the earlier (1962) booklet. Our newest publication, just out this summer, is a revised and enlarged BICENTENNIAL EDITION of The story of the Hay Bay Church. Originally written in 1962 by Dr. Arthur G. Reynolds, it has been reprinted three times, with total sales of 8000 copies. n 1830, Elijah Woolsey, a retired preacher of the Methodist Episcopal Church in the United States, wrote his memoirs of some 43 years of ministry. These were published in seventeen instalments in the CHRISTIAN ADVOCATE, a weekly four-page newspaper published in New York by the M.E. Church. Five of these chapters describe his two years as a saddlebag preacher in the Bay of Quinte & St. Lawrence regions, in 1794 and 1795. His memoir is the earliest first-hand account of a Methodist preacher in Upper Canada. That same year, 1811, Bishop Francis Asbury made his first visit to Canada. The summer of 1992 was the busiest one within memory at Hay Bay. Thank goodness a Bicentennial only comes once in 200 years. It was exhausting, but very rewarding. Here's a summary of how it was celebrated. A SERIES OF BIOGRAPHIC VIGNETTES ON THE TWENTY-TWO SUBSCRIBERS, WHO ARE SOMETIMES REFERRED TO AS "THE FOUNDERS" OF THE CHURCH. The story of the Bininger family is full of romance, missionary adventure and Christian devotion.